It is not one of the better quality photos, but my brother Ron (right) sent me a “guess who this is” photo from a trip he took this past weekend. At first I didn’t know who was in the photo with him, but after a close look at the background I deduced that it was a neighbor “boy” who we lived next to up on Lake Erie some 40-plus years ago. 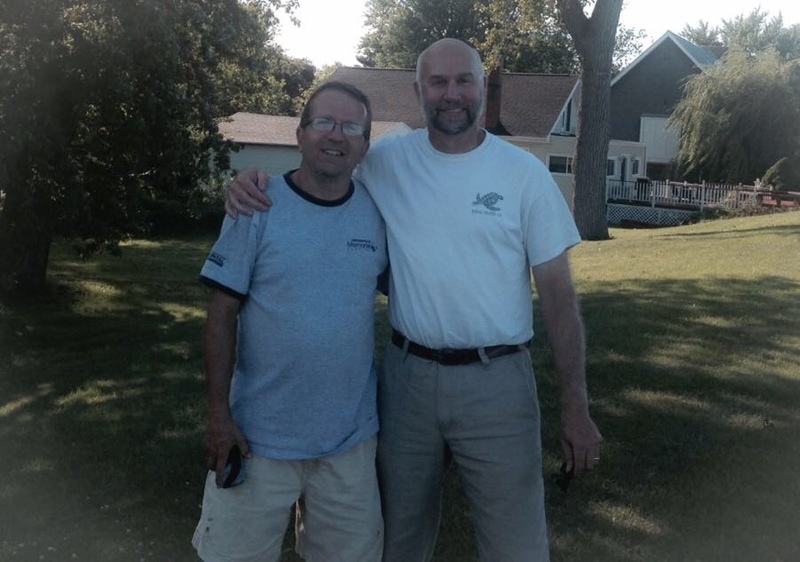 Yes, it was “Moose” … or our summer time neighbor Jim Raab. What great memories we had when Jim (and late brother Tom) and their family would move into their cottage next door to us for the summer. Ron and I could not have had a more idyllic childhood … and obviously the same must have been the case for Jim since the cottage is still in his family … and they still escape there to this day! One final comment Ron left with me by text message … and I too remembered “cupping my hands” like it was yesterday. Jim even took me inside their cottage. As I stepped in through the door I said I can’t forget how we’d come up to the screen door and ask if Tom and Jim could come out. He cupped his hands up by his face as if to put them up to screen to see in! We laughed!